The LA6 can be used like a traditional signal tower until now, thanks to advanced technology, it can more precisely display status or process with a variety of colors and sounds. External control programs are not needed because a CPU is embedded in the main unit. Functions, such as “Time,” “Residual Quantity,” and “Level Meter” are enabled by combining up to 21 colors, three operational modes, and 11 sounds. 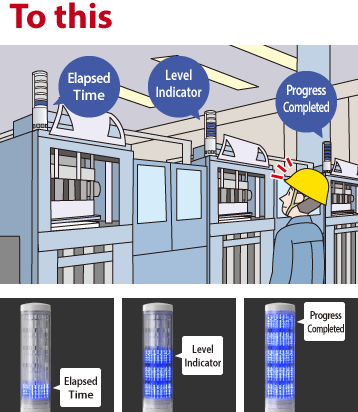 Thus, "Cycle Time" and "Downtime" can be displayed in the production site without the need for large-scale capital investments. Innovation in the LA6 technology can be used to solve problems in our most challenging applications. 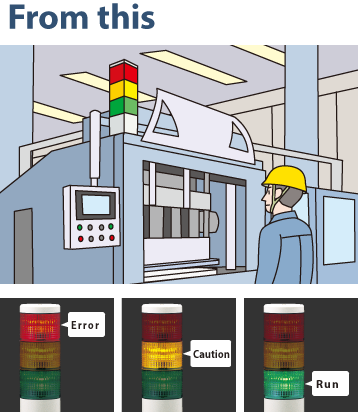 Up until now, the signal towers only display the status condition of the equipment, and have not extended beyond those features. In real time, status conditions (such as task progression, remaining material quantity, etc.) can become visible. Priority to maintain equipment can be recognized by the real time status conditions, which can ease the operator's responsibility. Moreover, monitoring sensors by displaying gradiant bars from the equipment can allow prompt action when necessary.